My article Will 1962 repeat itself? India Should Be Watchful appeared in The Statesman. My book review of Waiting for the Dalai Lama appeared in The Pioneer on Sunday. An Interview with Mr Nicolas Forissier, Member of the French Parliament and President of the French Parliamentary Group for Friendship with India. CA: Mr. Deputy: Could you first tell us what is the purpose of a Friendship Group, like the Indo-French Group in the National Assembly (Lower House of the French Parliament)? Do you have a counterpart in the Lok Sabha? In France, it is an old institution. The idea is to have formal relations between parliamentarians of different countries. Exchanges can be strictly on the parliament issues, like the functioning of our respective Houses, but it can also help develop other links and deeper relations between two countries. From this point of view, the Friendship Groups have an important role to play. They can’t obviously take the place of the government to government relations, but it can be an outside help to understand each other. In our case for example, we know better what our Indian friends are expecting from us and can understand better their vision; it is also useful to pass messages on our own positions. French companies find it particularly valuable to have such a Group which is able to explain, from another angle, the difficulties that they may be facing or even their hopes. That way, our talks are informal, we don’t sign MoUs or agreements; but, with our parliamentarian concerns, we are able to explain the French position. I am in favour of parliamentarian diplomacy. It does not take the place of the Ambassador, but it is an add-on. We can pass messages. It is a public relation exercise by elected representatives and as we are representing the people of France, we have a very strong legitimacy. We also come to listen and to understand what is happening in India. In France, we always had a Friendship Group in the Parliament; its creation is more recent in the Lok Sabha. But now, there is a group and Mr. Yashwant Sinha is the President. We met him in Delhi and we have decided to intensify our relations. It is the Group’s first official visit to India since 1998. I was very keen that our Parliament organizes such a visit. 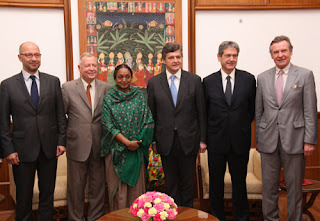 Moreover, I have noticed that since 5 years the relations between France and India have really intensified. I came for the first time in India as the Minister of State for Agriculture; I had earlier met Mr. Subhod Kant Sahay, my counterpart in Paris. He had said that India was keen to collaborate with France. When he asked me: “What can be done?”, I immediately answered: “I will come to India”. I came a month later. It was in 2005. I came again as inter-parliament delegate for the agro-food industries. This time, it is my 12th visit in 6 years. I was keen that the Friendship Group could officially visit India. For me, it symbolizes the intensification of the relations between India and France. All my Indian interlocutors concur with this: the relations between our two countries are excellent, we agree on most of the subjects. In fact, when we meet, it is more to see how to further move forward. From my side, whenever I have the occasion, I always push French companies to come and work in India; even if it is not easy. CA: I was told that there are very few articles on India in France, particularly on Indian politics. Would you like to comment? NF: France, till recently, was not sufficiently conscious of the importance of India; of what is happening here; of her wisdom too. I think that things are changing. I was telling you that I have seen a sea of changes during the last 5 years or so. It is not by chance, it is because some political personalities have worked for this. I am thinking first of President Nicolas Sarkozy and Prime Minister Manmohan Singh who renewed the strategic partnership; they have given a new kick-off to the relations. I have seen it in my own modest experience. It is not the same rhythm as before, it is faster and French companies are more and more interested by India. Our French delegation visited India this year; I have now officially invited our Indian counterparts to come to Paris next year. The idea is to have regular exchange. I told the President of the French Assembly that it was unthinkable that a French delegation should not visit India, at least one in a parliamentary term [five years]. It is the minimum we can do for a country like India. Through this relation with the Lok Sabha, many networks come into place; it is for me absolutely necessary. We are delighted to have had these contacts at the highest level; our report to the Parliament will be clear on this point. About the French Press, there was still insufficient comprehension of what is happening in India and the weight of India in the world. There are articles, but not enough, and not as many as on China because everyone has focused on China for the last decade. It is changing. Indian culture fascinates the French people. We have so many Indian exhibitions and performances. And now the interest slowly shifts from culture to economy and politics. CA: What about the strategic aspect? NF: France will have to quickly start looking at what is happening in India. It is essential. There is an evolution in this sense in France, but honestly more is done in the economic field for the time being. CA: Though there is a strong strategic partnership at the government level, today most think-tanks in France are more interested by China? NF: It is true. Chine is today a major actor; we have seen it again since the beginning of the economic crisis in 2008. China can’t be ignored because it the factory of the world and it has cash-flow surplus, but it is not a reason for India to be absent. In the past, the nature of our conception of India has been romantic and cultural. But one realizes now, that India is an economic power with responses to today’s world. It is also a market, for example in the agro-food sector. Our look on India is changing very fast, in particular thanks to the strategic partnership. President Sarkozy has often very strong intuitions, I know him well and from the start of his mandate, he had the intuition that the relations with India had to be intensified. It is what is happening. Our role as the Friendship Group is to accompany this movement, and to pass the message and develop new networks between France and India. Today our group is one of the two largest in the French Parliament (more than 120 MPs are part of it). It is larger than the Group for Friendship with the US. CA: What are your impressions after your visit to Renault and Michelin factories in Chennai? NF: In both cases, it is extremely large investments. Michelin will be the largest Michelin factory in the world. This morning, we have visited Renault-Nissan factory. It is huge and impressive; it will produce 5 different models of cars. It means that between 4 and 8 lakhs of cars will be produced before 2015. We also met the Michelin management. Both projects are very significant in terms of investment. It is symbolic of the will of French industry to invest in India. Today, we don’t satisfy ourselves by just exporting to India. We are in a global market and India is one of the leaders. Chennai and South India which were relatively less known by the French authorities and the French industry have now got a new dimension. More and more French companies are coming to Chennai (I hope that they will also come to Pondicherry soon). I find this interesting. CA: Could you tell us your opinion on the debate raging in India on FDI in the food supply chain? You earlier mentioned that your Indian counterpart had told you that France could help India in this field. NF: From an economic perspective, I am sure that common sense will prevail, but I have no judgment to put on Indian public debate. Personally, I believe that one should put in place safeguards to protect small retail businesses. As the Mayor of a small town in France, I always fight to defend the small retailers in my city. Apart from that, the modernization and the improvement of the distribution system, can only be positive for the stabilization of prices and for creating new jobs. I am not enough knowledgeable about the Indian scenario, but what I could understand from the Indian press, there is more advantage than inconvenience (in a large distribution system). But things have to take their own time, they have to ripen. I am conscious that the small shops are traditionally important in Indian culture; it is not only an economical issue, it is also a cultural one. I am not surprised that there is a debate on the issue in India. One has to take care to not create an imbalance (small retailers are part of the Indian culture), I believe that the implantation of large distribution system will come to India in a reasonable amount of time. CA: Will the farmers benefit from it? NF: If you have a very organized distribution system, it brings stability to the farmers. But they need to be themselves organized (I once visited Amul [in Gujarat] and was very impressed by what has been done in India, a remarkable organization!). When I speak of safeguards, it means that the producers, the farmers should also be organized. They should not be millions to negotiate with large wholesale dealers. The producers should also have a global vision. At the end, you should get an improvement in your quality of life; an improvement in revenue and in stability of the revenue too. At the same time, one should preserve small retailers. There is a delicate balance to find. It is normal that India has a debate, especially when you have a culture of fresh-cooking and small establishments in your street where you get the food from. It is true that there is a mutation in the Indian society and the middle class aspires today for a way of life comparable with ours. Just look at the malls: so many shops with the Indian and foreign brands; there is a need for this type of commerce. For me, what is important in this debate is to keep what makes the charm and the diversity of the Indian society (it is easier to say, than do!). I personally prefer to do my shopping in small retail shops and I am sure that millions of Indians feel the same. There is a subtle debate and hopefully it will ripen. Today there are perhaps political considerations in the debate, but there is more behind: a true debate. CA: Today, there is a strong debate on a Russian nuclear plant in Tamil Nadu. Can this influence the setting up of two French Areva plants in Jaitapur in Maharashtra? NF: I am not sufficiently informed on this subject. Everywhere in the world there is a debate on the nuclear. But often it is the same people who complain against the nuclear who come and see me in my city to grumble about a power cut. One should know what one wants. In this debate, I can tell you that the French offer (Areva) is the safest in the world and Areva’s search for security is permanent. Innovation is permanent. Security is an absolute priority in France. Our 58 reactors have recently been fully checked and they are in a perfect state. French Nuclear technology is the leader in the world, including in the field of security and reprocessing. It is clear that India needs power to continue its considerable development. When we met with the Chief Secretary of Tamil Nadu or the [Lt.] Governor of Pondicherry, their main topic was ‘power’, energy. In a short term, Tamil Nadu needs 8,000 to 10,000 Mws extra, not in 20 years, immediately. They are working on solutions. France can offer an energy ‘mix’. One is the nuclear and we are working with the Central Government (let us not forget that France pushed very hard in Vienna for India to have an exemption for the civilian use of nuclear energy from the IAEA). The French offer should be reassuring for India, because it is the ‘top’ and Areva wants to stay on the ‘top’. About the nuclear energy, citizens of France are asking the same questions than any citizens in the world. One has to be very demanding for security matters, but if one wants to have sufficient clean energy, the nuclear has to be part of the ‘mix’. We also have other offers, particular in the domain of solar and wind energies which have tremendously evolved during the last few years. We are not as advanced on the biomass, but we should soon make up this lateness. We are aware that we need to have 22% or 25% of renewable energy in 2025. It is certainly something which interests our Indian friends; it came up in discussions wherever we went, Delhi, Bangalore or Chennai. CA: A few words on the Rafale? NF: I believe that it is a remarkable fighter plane. 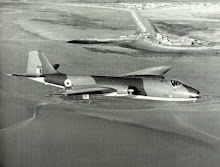 It is a multi-purpose plane which can answers all sorts of needs. We have worked with the Indian authorities in the past. We have also signed an agreement for the modernization of the Mirage 2000. In that case, I personally spoke to the President of the Republic and passed the message that the French offer should be competitive, because I knew that the Indian Air Force was attached to its Mirage. The deal for 126 Rafales would definitely be important for the French economy. CA: Pondicherry has been a French colony till 1954. Which role do you see for Pondicherry in Indo-French relations today? NF: For obvious historical reasons, Pondicherry has a special place in the heart of the French. Further, a large number of French nationals live there and Pondicherry receives many French visitors. The French Lyçée, the Alliance Française and the Consulate General are important elements in the Indo-French relation. It is why I made sure that we would spend at least 2 days of our heavy-scheduled Indian visit in Pondicherry. Now, we have to improve our presence in Pondicherry, facilities have to be improved, I am particularly thinking of the French Lyçée, which is one of the best in France as far as the results are concerned. It is an asset and it should be supported. We have also some expertise in the field of urbanism (we discussed it with the [Lt] Governor) and the Chief Secretary). Valorization of the architectural heritage is important. Pondicherry has an exceptional heritage, it has to be restored. And for the economy, there is the possibility of creation of new jobs in the tourism sector. With its historical links, France can help; let us also not forget that France is the first tourist destination in the world. France has a knowhow and can help. Also in the field of sustainable town-planning, we have some of the best world experts, many French companies and architects are working in this field. The [Lt.] Governor asked our help in energy, education (student exchanges), sustainable town-planning (heritage preservation). To conclude, all these elements that I just mentioned were something I was feeling before coming: there is a tremendous improvement in the bilateral relations. My colleagues have the same feelings. We want to carry this message to the French government and the French companies. We want France to be more and more involved. The formidable evolution of the Indo-French relations should not be ephemeral, but sustainable in the spirit of a win-win partnership. It is true that the 2008 economic crisis has complicated things. It is not easy. We should nevertheless pursue these objectives. The rumor was so persistent that Prime Minister Manmohan Singh had to reassure the Lok Sabha “Our government does not share the view that China plans to attack India,” adding that India’s borders with China “by and large remain peaceful”. 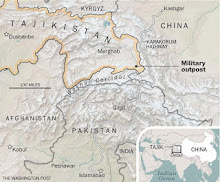 In the Parliament, it is the Samajwadi Party Chief Mulayam Singh Yadav who declared that he had information that China was making preparations to attack India and that Beijing had “marked out areas near the borders for this purpose”. A few weeks earlier, a Senior IDSA Fellow Ali Ahmed had also put oil on the fire by publishing a Brief (‘A Consideration of Sino-Indian Conflict’) in which he spoke of hostilities “confined to a specific section of the border, limited in duration and amenable to a negotiated termination,” a Kargil-type situation. Though Defence Minister AK Antony affirmed that no infiltration had taken place across the LAC in Arunachal Pradesh, he admitted: "there have been instances of a few Tibetan herb collectors inadvertently crossing over into Indian territory in the last two years." It is common knowledge that the Chinese are masters at testing the ground by sending herders or herb collectors to scout areas that they ‘perceive’ as theirs. The postponement of the Special Representatives’ talks which was conveniently attributed to the fact that the Dalai Lama was to address a Buddhist Conference in Delhi, was one more sign that Beijing is not interested to clarify these ‘differences of perceptions’. When Antony mentioned his ministry’s decisions to deploy new radars: “the deployment of radars, including mountain radars, is based on various factors like operational requirement of IAF and security needs of the country”, it send shivers down the public’s spine. One can’t deny that it is the perfect time to attack India; in a few years she may be much better prepared. Take the roads for example: in January 2008, during a visit to Itanagar and Tawang, the Prime Minister announced a Rs 24,000 crores package for the State. The priority was given to the roads (in particular, the construction of a Trans-Arunachal Highway). With the road being enlarged between the plains of Assam and Tawang (en route to the Tibet border), one finds the messiest imaginable road site which has become the favorite topic of local jokes. It will definitively be different in five years time. It is however difficult to share the analysts’ pessimism. One of the reasons is that China has its own problems to deal with. First and foremost there will be a leadership change in 2012. President Hu Jintao, Premier Wen Jiabao and five others of the nine-member Standing Committee of the Politburo, will retire in October next year. China will then witness a period of transition, in other words, a time of instability which could last for a couple of years. To decide to go to war (with India or any other nation), China needs a stable and strong established leadership or as in 1962, a leader with extraordinary charisma (Mao Zedong); it is not the case today. The main factions of the Communist Youth League Clique (led by Hu Jintao) and the Gang of Princelings (led by Xi Jinping) will have to fight it out to take an ascendant path and impose hard decisions. Could a new Mao emerge from the Fifth Generation? It is doubtful. There are other differences between 1962 and 2011: the then foolish Indian leadership did not dare to use the Air Force, it will not be the case today; a full squadron of Sukhoi-30 aircraft have now been deployed at Tezpur air base in Assam (another squadron has been brought to Chabua in Upper Assam). Further, the IAF is planning to open six Advanced Landing Grounds, as well as several helipads in areas close to the border. This may take some time, but the process has started. Were India attacked today, it will not remain a localized conflict (as predicted by IDSA) like in 1962; any Chinese misadventure would trigger an ‘all-out’ conflict, and India would certainly not hesitate to attack the PLA infrastructure in the Nyingchi Prefecture, north of the McMahon line. Hopefully, the Chinese are aware of this. It has been in the public domain that two new infantry divisions have been raised and that the Government is looking for a place in the Northeast to set up the headquarters of a Mountain Strike Corps. Another crucial factor is the support of the local population in Arunachal and Ladakh. In 1962, some villages fully supported the invading Chinese troops. 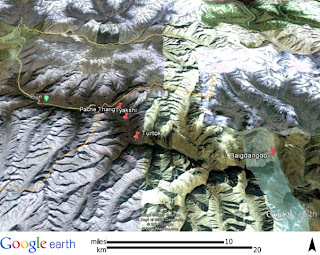 How else could the PLA have built a road from Bumla, the border pass, to Tawang in 18 days? It is not difficult to imagine the amount of accurate intelligence required for this feat. 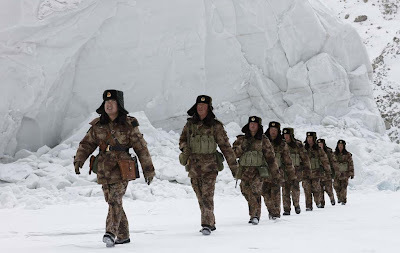 China perhaps cannot ‘take back’ Tawang militarily; the PLA could at the most occupy a few ‘disputed pockets’ like Samdorong Chu valley, north of Tawang or Demchok in Ladakh, but in the process, Beijing would lose India’s present goodwill and the international respect they earn through their ‘peaceful rise’ policy as well as their integration into the world scene as a responsible State. Further, it should not be difficult for India to instigate a 1959-type rebellion in Tibet and support it militarily; at least a civil disobedience could be organised. Let us not forget that an alien PLA has already to deal with a resentful local population on the Tibetan plateau. The recent immolations of monks and nuns in Eastern Tibet are a proof of this. It is true that China has been rather aggressive on the border issue lately and that India is not fully ready to tackle the Dragon, but India has her own cards to play and hopefully, she will play them well. The proposed launch of the Agni-V long range missile is one of these cards. It has already made Chinese policy makers ponder. The People's Daily stated that it reflects India's “intention of seeking regional balance of power”. The mouth piece of the Party quoted some Indian and scientists describing Agni-V as a ‘killer for a certain country’. If Beijing wants again to ‘teach a lesson’ to India, it will indeed be a Himalayan task, and what will Beijing gain in the bargain? Nevertheless, China can use more asymmetric types of warfare, cyber-warfare is one of them. While India continues to prepare the defence of her borders, she should remain watchful of her interests and not take for granted the profession of friendship by anybody. Have you heard about this Indian Hero? My article on Colonel Chewang Rinchen is posted on Rediff.com. 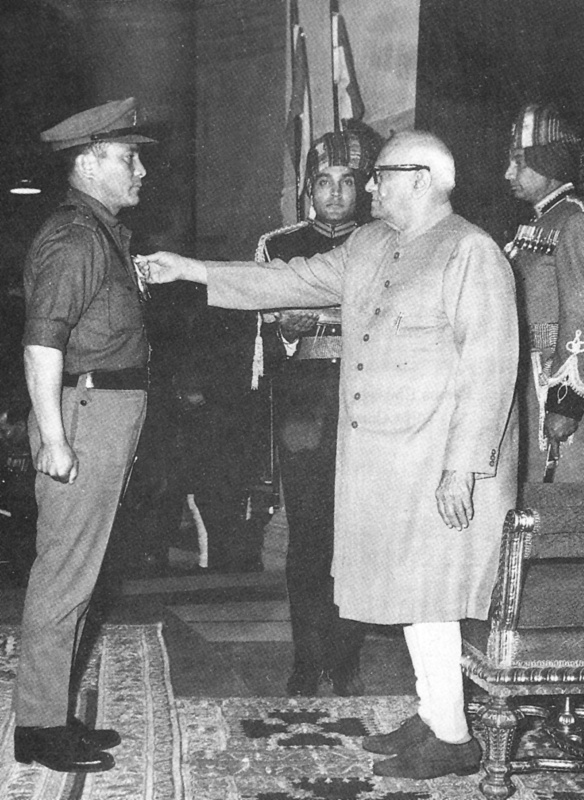 Major Chewang Rinchen became the youngest recipient of the Maha Vir Chakra (MVC). He not only seized the highest post ever captured, but also liberated an area of 800 sq km from Pak occupied Kashmir, the largest area captured in the 1971 war with hardly any supplies and no artillery support. Claude Arpi salutes this brave Indian soldier. Have you heard of Colonel Chewang Rinchen? In 1948, at the age of 17, Rinchen enrolled in the Indian Army; the same year, he won his first Maha Vir Chakra, becoming the youngest recipient of the prestigious decoration. Born in 1931, Chewang could have spent his entire life in the remote village of Sumur, at the confluence of the Shyok and Nubra rivers. But the visit of the Kalon (minister) of Ladakh changed the course of his life. The official spotted the spark in the 13-year boy and after gaining the approval of his parents, decided to take him to the Leh to educate him. Four years later, in one of the most daring operations of the 1947-1948 War, Captain Prithi Chand and a few of his Lahauli companions saved Leh by reaching the Ladakhi capital before the Pakistani raiders: They had done the impossible, cross the Zojila pass in winter. The captain soon became the mentor of the young Rinchen, who underwent a short military training under him. Rinchen then recruited 28 of his friends from the Nubra Valley and created the Nubra Volunteer Force. They were to play a crucial role in 1947-1948 War. In April 1969, Major Chewang Rinchen was finally given a regular commission in the Indian Army and was posted with the 14 J&K Rifles. His battalion was soon transferred to Firozpur in Punjab. But when the heat of the summer became too unbearable for the young Nunnu (name given to the natives of the Nubra Valley), he applied for a transfer back to the Ladakh Scouts. This was granted. In August 1971, as the clouds were gathering over the Indo-Pakistan border, Rinchen joined his old regiment; he was sent again to his beloved Nubra Valley. A month later, Rinchen started reorganising the Nubra Guards, giving them a special training in firing small arms. He enrolled 550 young local volunteers and organised them into four companies (called by the names of the nearby ranges Karakoram, Saser, Remo and Saltoro). Their training lasted two weeks from November 1 to 15. Major General S P Malhotra, the General Officer Commanding of 3 Infantry Division responsible for the defence of Ladakh, then asked Rinchen and Colonel Udai Singh, his commanding officer, if they could look after the Nubra/Shyok sector of the border. Rinchen confidently told his GOC that the Ladakhi Scouts and the Nubra Guards did not need any additional forces; they would do it. Situated 140 km north of Leh, the Nubra Valley was linked to the capital of Ladakh via the Khardung La, the highest motorable pass of the planet at 5,602 metres. Though the last round of the Special Representatives of India and China on the border issue was postponed by Beijing on the lame pretext that the Dalai Lama was to address the Global Buddhist Conference in Delhi, the fact remains that the intricacies of the border issue are generally not well understood in India (and in China, I presume ). 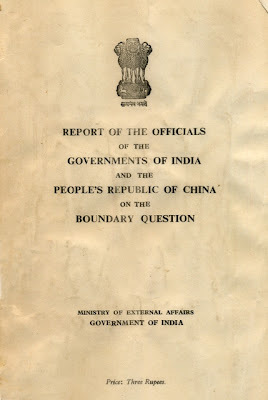 To get a better understanding, one can read the 1960 Report of the Officials of the Governments of India and the Peoples’ Republic of China on the Boundary Question. I am posting here the Introduction. The first part of the Report published in 1961 by the Ministry of External Affairs is posted on my website.During the coming days, other parts will be online. 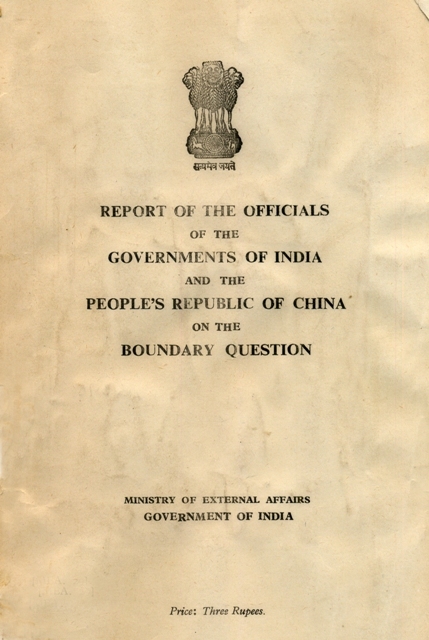 The reading of this Report along with The Notes, Memoranda and letters Exchanged and Agreements signed between The Governments of India and China. known as The White Papers (some are also posted on my site) helps to understand why after more than 50 years of 'talks', very little progress has been made on the border issue. 1. The Prime Minister of India and the Premier of the State Council of the People's Republic of China met in Delhi from the 19th of April to the 25th of April 1960 to discuss certain differences relating to the border areas which had arisen between the Government of India and the Government of the People's Republic of China. The two Prime Ministers explained fully the respective stands of the two Governments and as a result, there was a better appreciation of the points of view of the two Governments. The talks, however, did not resolve the differences that had arisen and the two Prime Ministers decided that officials of the two Governments should examine the factual materials in the possession of the two Governments in support of their stands. The two Prime Ministers, therefore, agreed that officials of the .two Governments should meet and examine, check and study all historical documents, records, accounts, maps and other material relevant to the boundary question, on which each side relied in support of its stand, and draw up a report for submission to the two Governments. This report would list the points on which there was agreement and the points on which there was disagreement or which should be examined more fully and clarified. This report should prove helpful towards further consideration of these problems by the two Governments. It was further agreed that the officials should meet from June to September, 1960, alternately in the capitals of the two countries. The first meeting should take place in Peking and the officials would report to the two Governments by the end of September, 1960. During the period of further examination of the factual material, every effort should be made by the parties to avoid friction and clashes in the border areas." 2. Dr. S. Gopal, Director, Historical Division, Ministry of External Affairs. 3. Shri V. V. Paranjpe, Adviser. 4. Shri T. S. Murty, Adviser. 5. Shri G. N. Rao, Adviser. 1, Mr. Chang Wen-chin, Director, First Asian Department, Ministry of Foreign Affairs (Leader). 2. Mr. Yang Kung-su, Director, Tibet Bureau of Foreign Affairs. 3. Mr. Chien Chia-tung, Adviser. 4. Mr. Liao Teh-yun, Adviser. In addition, the Indian team was assisted by Dr. K. Gopalachari as an Adviser during the Delhi Session. Similarly, the Chinese team was assisted as Advisers by Mr. Tu Kuo-wei and Mr. Chu Chen-chi during the Peking session and by Mr. Ho Ta-chi during the Delhi and the Rangoon sessions. 4. The officials of the two teams have held three sessions in fulfillment of the assignment given to them. In accordance with the communique, the first session of the meeting of officials took place in Peking from the 15th June to the 25th July during which 18 formal meetings were held. At this session the agenda pattern was discussed and determined, and the first item of the agenda (Location and Natural Features of the boundary) was completed. The second session was held in Delhi from the 19th August to the 5th October during which 19 formal meetings were held. At this session discussions on the second item of the agenda (Treaties and Agreements; Tradition and Custom) and the third item (Administration and Jurisdiction) were completed, thereby concluding the entire substantive work of examining the factual material in the possession of the two sides. 5. The Joint Communique envisaged that the officials should complete their assignment by the end of September, but the two teams realised that despite their determined efforts, the assignment given to them, because of its size and scope, could not be completed within the stipulated period. Therefore, on the 24th of September the leaders of the two official teams dressed a joint message to the Prime Ministers of the People's Republic of China and the Republic of India requesting them to extend the prescribed time-limit to the minimum extent necessary. The two teams agreed to continue in session to complete the substantive work in Delhi and suggested that after a short break a third session might be held for the purpose of completing the work and finalising the report for submission to the two Governments. 6. The Prime Ministers of the two countries were pleased to agree ~o this extension and, after mutual consultations between the two Governments, it was decided that the third session be held in Rangoon. The Burmese Government were good enough to agree to the request of the two Governments and made the necessary arrangements for holding the meeting in their capital. 7. The third and final session of the talks started at Rangoon on the 7th of November and after 10 formal meetings concluded today with signing of this report. 8. The task assigned to the officials, though limited to the study of the evidence and the documentary material in support of the stands of the two Governments, was nevertheless voluminous and difficult. Moreover, the Sino-Indian Boundary question has an obvious bearing on the friendly relations between the two neighbouring countries. The two teams were fully conscious of the complexity as well as the importance of the assignment which had been entrusted to them. The following report embodies the earnest and sustained labours of the Chinese and the Indian official teams spread over a period of nearly six months. During the discussions, each side not only furnished factual material to' substantiate and elaborate the stand of their own Government but endeavoured to explore the viewpoint and evidence of the other Government. It is hoped that the report will enhance the understanding of the facts relating to the Sino-Indian boundary and prove helpful to the further consideration of the boundary question by the two Governments. 9. The report is formulated in accordance with the framework which was agreed upon after consultations between the two teams. The first part of the report is an introduction summarising the discussions which led to the adoption of the agreed Agenda and the commencement of the substantive examination of the evidence. The second and third parts contain the summary of the factual material and comments brought forward by the Indian and the Chinese sides respectively in support of the stands of the two Governments. It will be observed that the statements and comments of each side in the report were drafted by the side concerned and faithfully explain each side's understanding of the factual material furnished and the discussions held during the meetings. The actual pattern within the' substantive part of the report corresponds to the framework of the agreed Agenda. 10. The two teams would like to record that notwithstanding the difficulties of the assignment and the differences in the understanding of the facts relating to the question, they worked in harmony and in a spirit of cordiality and co-operation throughout these meetings. Sd. Chang Wen-chin, Director, First Asian Department Ministry of Foreign Affairs, People's Republic of China. Sd. J. S. Mehta Director, China Division, Ministry of External Affairs, Government of India. Sd. S. Gopal, Director, Historical Division, Ministry of External Affairs, Government of India. 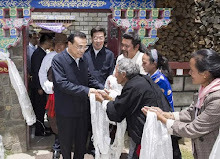 Mr. Zhu Weiqun, the Executive Vice Minister of the United Front Work Department of the CPC Central Committee who has been negotiating with the Dalai Lama's Envoys says that the Party and its officials should not believe in Religion. In the past the Party has often interfered with the management of the monasteries and the selection of the reincarnated Lamas in Tibet. The Communist leaders should also stop using 'their' Panchen Lama. On this picture one sees, former Tibet's Party boss Zhang Qingli with Beijing's Panchen Lama. The Party should continue to use of its dialectical materialism view of the world and forget about Religion, a poison according to Mao. Members of the Communist Party of China (CPC) shall not believe in religion, which is a principle to be unswervingly adhered to, a senior official has said. The Party would suffer "pernicious" consequences if members are allowed to believe in religion, said Zhu Weiqun, executive vice minister of the United Front Work Department of the CPC Central Committee. "Party organizations will be greatly weakened in the fight against separatism, as hostile forces home and abroad are doing what they can to use religion for their separatist activities in the areas inhabited by ethnic groups," said Zhu in an article published in Qiushi, or "Seeking Truth," the biweekly official journal of the CPC Central Committee. Zhu slammed the growing occurrences of CPC members participating in religious activities, establishing close contacts with religious figures and some members becoming de facto religious believers. Some people, even within the Party, have said the ban of CPC members believing in religion should be lifted. They listed the "reasons and benefits" for CPC members to believe in religion, and even argue the ban was inconsistent with the Constitution, Zhu said. "If the Party lifts the ban as some people suggest, it can hardly see the promised benefits and will instead suffer obvious pernicious consequences," Zhu said in the article. The CPC's use of Marxism and all its theories, ideas and actions as a guide is based on the dialectical materialism view of the world, Zhu noted. The Party will be divided ideologically and theoretically if members are allowed to believe in religion, as it means the coexistence of both idealism and materialism and of both theism and atheism, compromising the guiding role of Marxism. The Chinese Communist Party lives in another world or in another time. The ideologues still dreams of a Great Socialist Revolution. They quote Comrade Mao: "the leadership’s control of thought is the most important leadership control." The author of this article translated by Chinascope tells us: "Our Party has attached great importance to strengthening its position as the sole leader in the field of ideology ...For the Party to lead politically in the field of ideology, it must use the scientific theory of Marxism and the Party's strategies, principles, and policies to guide the development of socialist ideology; for the Party to maintain its leadership over thoughts in the field of ideology, it must vigorously promote socialist ideology, resist and criticize all erroneous thoughts, and ensure that socialist ideology gradually occupies the entire field of ideology." The question is what is 'socialist ideology' in practice? One evening early this year, a red Ferrari pulled up at the U.S. ambassador's residence in Beijing, and the son of one of China's top leaders stepped out, dressed in a tuxedo. Bo Guagua, 23, was expected. He had a dinner appointment with a daughter of the then-ambassador, Jon Huntsman. This is probably was is known as 'socialism with Chinese characteristics'. Whether or not, Bo Xilai is be able to make it to the Standing Committee of the Politburo (one of the nine bosses of China) in 2012, the problem will remain the same. As we have seen in my previous posting, China is in turmoil and it is not ideology that will convince the people of China that their leaders are not sincere. It is like in India, ministers exploiting mines in Jharkand, Goa or Karnataka, telling the people: "Anna Hazare is not representing the people. We are the legitimate representatives". Managing ideology work has always been a very important function for our Party. Missteps in managing the economy will cause big problems. Missteps in managing ideology will also cause big problems. Therefore, we should not slacken in our work on ideology while focusing on economic development. Strengthening the Party’s sole leadership over ideology, firmly controlling the direction of that ideology, and strengthening our motivation and foresight are important magic weapons for our continued victories. 1. Establish a central standing organization and strengthen the Party's control over ideology. Back when the Chinese Communist Party was first established in 1921, our Party created a propaganda agency responsible for propaganda and agitation and for promoting revolutionary development. After the Sixth CCP Congress, the Central Propaganda Department became a permanent branch (of the government) and assumed its responsibilities and functions as the supreme organization for propaganda, for the education of the whole country, and for the political thought education of CCP cadres and the general public. In July 1942, Comrade Mao Zedong stressed that "the leadership’s control of thought is the most important leadership control." Because of the extreme importance of ideology, we must regard the improvement of the CCP’s ability to lead in ideology as the keystone to improving our ability as a ruling Party, and we must firmly control the Party’s leadership over ideology. This is the key to maintaining the invincible position of our Party and our socialist cause. We must carry out a clear-cut battle between the two opposing ideologies (socialist ideology vs. the capitalist ideology) to provide a powerful guarantee that the direction of our reform and opening-up policy will be correct. Since the reform and opening-up, our Party has attached great importance to the confrontation and struggle between ideologies, actively responded to domestic and overseas challenges, and scientifically led in the development of ideology. Deng Xiaoping stressed that "liberalization itself is bourgeois; there is no such thing as proletarian or socialist liberalization. ... Promoting liberalization will lead us to the capitalist path." This suggested that fighting bourgeois liberalization is a long-term task. … Since the beginning of the 21st century, in responding to some erroneous thoughts and views questioning the current reform and the Party's basic policies, the Central Propaganda Department and other departments have edited “The Six Whys - the Answers to Several Major Issues," "Seven ‘How to Understand,’" and the "Learning Guide on Drawing ‘Four Major Boundaries’" to help cadres and the general public clarify some major issues and consciously resist the infiltration of erroneous ideas. We should use propaganda, education, and scientific indoctrination to enhance the attractiveness and fighting power of Marxism-Leninism. Lenin once pointed out that, in the course of the proletarian revolutionary struggle, "socialist consciousness is something instilled from outside of the proletarian class struggle, rather than spontaneously generated from the struggle itself." Using Lenin's "concept of indoctrination" as our guide, our Party has actively promoted positive education, vigorously disseminated Marxism and the theory of the new democratic revolution, and strongly accelerated the process of democratic revolution. We need to combine the sole leadership over socialist ideology with the concept of the diversity of cultural development. Since the reform and opening up, the development of social thoughts has been very active, and social consciousness has become diversified. This requires us to handle the relationship between the sole leadership over socialist ideology and the diversity of cultural values. We should combine the development of socialist ideology with our efforts to expand the opening-up and development of the socialist market economy. Since the reform and opening-up began, we have adhered to the development of socialist ideology. At the same time we also expanded the opening-up and development of the market economy. As a whole, we correctly handled the relationship between the development of ideology and the expansion of the policy of opening-up and developing the socialist market economy. In fact, we prevented the ideology "centralization" and "enforcement" theories, and also paid attention to guarding against the ideology "useless" and "dilution" theories. In all, since the establishment of the CCP 90 years ago, our experience and history in controlling ideology tells us that the strategic position and function of managing ideology should not be neglected and that the Party's leadership over ideology cannot be relaxed. We must unswervingly adhere to Marxism as our guide in the field of ideology and scientifically educate and correctly guide the changes in people's moral and value systems. Source: Qiushi Journal, “The Chinese Communist Party’s 90 Years of Experiences in Managing Ideology Work,” September 5, 2011. While more and more 'serious' analysts have begun predicting that China will soon be the Number 1 Super Economic Power of the planet, turmoil and unrest are increasing by the day in the Middle Kingdom. The repression is often ferocious as we can see from this video which has recently emerged on YouTube. It was shot during the months of March/April 2008, near Sera Monastery in the outskirts of Lhasa. The footage shows a total of eight people – seven men and one woman – being detained, although a list that appears in the hands of police in the video suggests police were targeting at least ten people for detention. The sheer display of force to detain these unarmed individuals, who are mostly in bed at home when the police arrive, is notable; the video shows personnel from at least three branches of the police involved in the sweep. The security personnel in black uniforms and helmets, many of whom are carrying assault weapons – and who appear to be leading the operation – are Special Police, although some are also seen carrying long sticks; several of whom have plain clothes beneath their vests and helmets, and not all of these personnel appear to be armed. The normal civilian police are involved, identified in some instances by the characters “Jing Cha” and “Police” in English on their vests; while those in green camouflage uniforms and black helmets often seen carrying only a truncheon, are from the People’s Armed Police Border Defense, according to the characters clearly seen on the sides of their helmets throughout the video. Police have blocked roads leading to the village of Wukan. Local people are trying to keep them out. The row - over village land taken by the local government - has been simmering for some time. 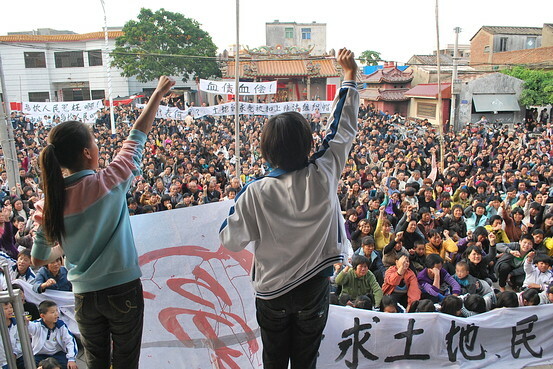 A new wave of protests broke out several days ago after the death of a villager while in police custody. It is not easy to get information about what is going on in the area. One local official denied there was a problem. 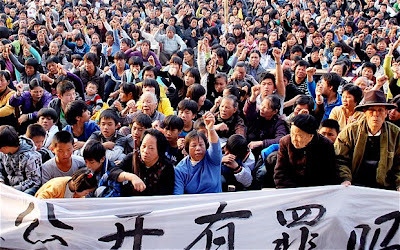 But it appears that villagers have held a series of protest rallies over recent days involving hundreds of people. A video of one demonstration, posted online, shows angry protesters shouting slogans such as "Down with corrupt officials. Someone told Bristow: "We will continue our fight until the end." Since then, 'Silence': it is so serious that the incident has been blocked on Internet sites, blogs and microblogs. Even more ominous is an incident between Han Chinese and Tibetans in Chengdu, the capital of Sichuan Province. Some 3000 Chinese students went on a rampage on December 15, beating Tibetan students and breaking into their dormitories and class rooms at the Railways Vocational Institute. The incident took place at a Chinese railway engineering vocational institute in the provincial capital city of Chengdu. Around 200 Tibetan students were held hostage as 3000 Chinese students attacked their dormitory, trashing the Tibetan students and breaking the doors, windows, and furniture. The Chinese students shouted 'Beat a Tibetan, Get an extra credit,’ and broke the doors of the Tibetan dormitories in the institute. Many Tibetan students have been reportedly hospitalised carrying severe injuries. 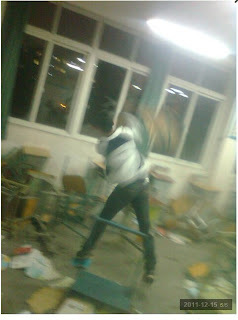 After the school authorities failed to quell the clashes, police had to be called to control the situation. More than 1000 People’s Armed Police personnel arrived at the scene and reportedly hurled tear gas to disperse the crowd. Several police and school vehicles were also damaged in the clashes. It appears that when then Tibetans students came for lunch at the school mess the next day, the Chinese students started shouting: ‘Han Chinese have been victorious over the proud Tibetans’. This demonstrates the seriousness of the ethnic tensions between Han Chinese and other 'minority' groups. China has today become World No 1 for unrest and riots (all categories). One usually believes that China is a powerful nation with a breathtaking development rate and that the Chinese people suffer from a superiority complex. It is partially true. In a recent editorial in Xinhua, Li Hongmei made fun of India which, he said “needs to, first and foremost, break through its own psychological fence." 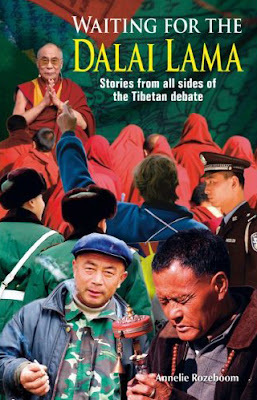 In this context, the new book of Annelie Rozeboom Waiting for the Dalai Lama — Stories from all sides of the Tibetan debate (Jaico Publishing) is worth reading. Though there are many facets to what the author calls the ‘Tibetan debate’, we are often more aware of the problems facing the Tibetan Diaspora, probably due to the Dalai Lama’s ceaseless activities. Rozeboom, a journalist who has been posted in China for 11 years and has widely reported about the country’s rapid growth, beings out other aspects by interviewing personae on both sides of the Himalayan curtain. She travelled to Tibet (with Beijing’s permission) and later to Dharamsala to record the stories of refugees as well as those who continue to work ‘with the system’. Though she could not meet senior working Chinese officials, she often quotes from the Party’s publications to give Beijing’s point of view. After reading these portraits of a Tibetan beggar, tortured monk, university professor, Chinese cadre, exiled-government official, Tibetan doctor, activist or even foreigners living in Tibet, one get a more encompassing view of the Tibetan scenario. The title of the book (‘Waiting for the Dalai Lama’) answers questions about the tense situation in Tibet today. Reading the tales of the interviewees, one understands that China should not have a superiority ‘complex’. In October 1950, Mao’s troops entered Tibet to ‘liberate’ the Roof of the World; nine years later, despite the best efforts of the Dalai Lama, Tibet was still not ‘liberated’ and the Tibetan leader had to take refuge in India. The Communist leadership in Beijing may speak of India’s inferiority complex, but the fact that the Dalai Lama and one lakh of followers escaped to India to live a better and freer live was a serious shock for the Chinese ego. The 1962 conflict mentioned by them as a source of India’s ‘inferiority’ was the direct consequence of the Dalai Lama crossing over to India at Khenzimane, at the bottom of the Thagla ridge, the place of the Chinese first attack in 1962. 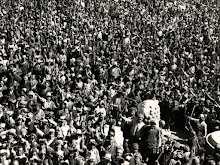 Today like in the 1980’s, the people of Tibet wait for the Dalai Lama. Beijing today lives in fear. It is the fundamental question behind all Rozeboom’s interviews: Tibetans are unhappy and want the Dalai Lama to return to a Tibet free from its present ideology. Today Beijing is promoting Cultural Revolution-like policies. In January 2011, the 5th Tibet Work Forum, a strategy meeting was attended by the 300 senior-most Party members as well as PLA leaders. One of the schemes put in place after the Forum was: some 21,000 Party officials were to be sent in teams of four to each of the TAR’s 5,453 administrative villages and resident committees. They were to remain there for a period of 4 years. In October, the officials’ first arrival in the villages received a great deal of publicity. Each team member is supposed to rotate to a new location after 12 months, though he must remain in the village for at least 25 days per month. The objectives of the scheme were five-fold: (1) strengthen the Party organization at the grass root level, (2) promote stability by persuading villagers to join the struggle against the ‘Dalai Lama’s splittist activities’, (3) improve the economy of each village and create new jobs, (4) educate the locals to appreciate and be grateful to the motherland and the Party, and (5) get each village to begin to more effectively carry out the plans and policies the above policies. That is why the Tibetans (and perhaps some Chinese) are waiting for the Dalai Lama; he believes in managing ‘the human mind’, not ‘ideology’. 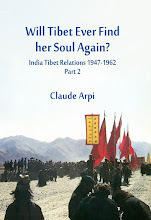 Though the book has quite a few factual errors (for example the author says that Heinrich Harrer went to Tibet in 1930’s when he entered in 1944), it remains timely; reading the collection of interviews is enjoyable. Mr. A.K. Antony, the Indian Defence Minister stated in the Parliament that "though no infiltration has taken place across the LAC in Arunachal Pradesh, there have been instances of a few Tibetan herb collectors inadvertently crossing over into Indian territory in the last two years." This reminded me of my interview with Kiren Rijiju, then Member of Parliament representing Arunachal Pradesh (West). He did not share the government's and Indian Army's perceptions about Chinese incursions in his border state. Question: Is it the army or grazers? Answer: Grazers are basically a camouflage because the terrain is very difficult. I am speaking of areas from eastern Arunachal (Walong) to the western part (Tawang). The public (and the government) only know of Chinese incursions if it happens in known places like Tawang. When incidents happen in more remote places, it does not come to the notice of the general public. The army keeps it secret. They won't let the people know what actually happened. I believe it is changing, but at a slow pace. Regarding the 'perceptional' border (the Line of Actual Control), the Chinese side is probably not very interested to settle the issue. Antony said decisions regarding deployment of radars, Antony said decisions regarding deployment of radars, including mountain radars, are based on various factors like operational requirement of IAF and security needs of the country. Though no infiltration has taken place across the LAC in Arunachal Pradesh, "there have been instances of a few Tibetan herb collectors inadvertently crossing over into Indian territory in the last two years," he said. These Tibetan intruders were apprehended and subsequently deported on completion of formalities as per the existing procedure, he said. On ways to check infiltration, Antony said, effective border management is carried out through surveillance and regular patrolling by Army and border guarding forces. Replying to a question on encroachment of border areas, the Defence Minister denied any such report and said, "However, there is no commonly delineated Line of Actual Control (LAC) between India and China." There are few areas where India and China have different perception of the LAC. Due to perceived differences in alignment of the LAC, some cases of transgression by the Chinese patrol beyond Indian perception of LAC do occur, he said. Xi Jinping: a traumatic youth? The Telegraph article posted below quotes Chinese Premier Wen Jiabao telling a group of students how his family was "constantly persecuted during the darkest years of Chairman Mao's rule". The Telegraph said that it may be "a warning to the hardline faction within the Communist party not to repeat the mistakes of history". 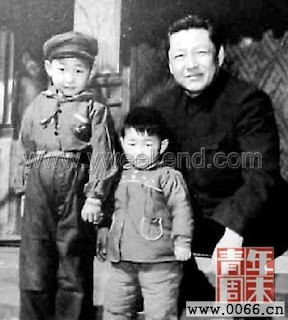 Another leader who must have suffered a great deal during his youth, probably more than Wen, is China's future President, Xi Jinping. While Wen's father was persecuted during the Hundred Flowers Bloom movement instigated by Mao, ('Letting a hundred flowers blossom and a hundred schools of thought contend'), Xi Zhongxun (Xi Jinping's father) was 'purged' by Mao in September 1962, mainly due to his closeness to Marshal Peng Dehuai who had dared criticizing Mao for his Great Leap Forward. This was Mao's first act of vendetta before the Great Proletarian Cultural Revolution. Interestingly, the Chinese press never mentions Xi Jinping's childhood. ...At the 10th plenum, Mao revealed that Peng Dehuai and the three men denounced with him at the Lushan conference were to be subjected to further investigation, by a special case review commission (zhuan'an shencha weiyuanhui). Deng Xiaoping announced that, as suggested by Kang Sheng, they would no longer be entitled to attend meetings of the party bodies of which they were still member, though this was almost certainly only a formal confirmation of the current situation. Mao was indicating to all and sundry that Peng could write as many letters at whatever length he pleased, but he would be rehabilitated only over his de ad body-which is what eventually happened. All and sundry suited their words to the Chairman's mood, and Peng was roundly denounced at the plenum for his latest missives which, among other things, were said to be in concert with China's enemies, labelled for convenient memorization as the 'three ni's and the one tie' that is, Kennedy (Ken-ni-di), Nikita Khrushchev (Ni-ji-ta He-lu-xiaa-fu), Nehru (Ni-he-lu), and Tito (Tie-tua). Whether Mao's colleagues had any compunctions about colluding in his further act of vengeance against the already disgraced marshal is unknown. But they should have been more alarmed at the Chairman's announcement of the creation of a second special case review commission to investigate a totally new victim, for it exhibited Mao's readiness to believe in plots against him. The new 'anti-party' figure was a key vice-premier in Zhou Enlai's State Council, Xi Zhongxun, who sometimes acted as premier when both Zhou and Deng Xiaoping were absent from Beijing. The identity of his chief persecutor, Kang Sheng, and the grounds for and manner of Xi's disgrace provided a foretaste of the early months of the Cultural Revolution. Kang Sheng was a sinister and shadowy figure even to his colleagues, sinister because of his activities in the Soviet Union and Yan'an prior to 1949, shadowy because for the first six years after the CCP's conquest of power he had been almost invisible, apparently ill. Nevertheless, he was evidently a man of considerable ability; Tian Jiaying regarded him with great respect, and referred to him as 'the sage of the eastern sea' (danghai shengren). ...By 1962, the reason for Kang Sheng's seat on the Politburo may have been a mystery to the 80 per cent of the CCP's 17 million plus members who joined after 1949. Kang had been almost invisible during the early years of the PRC. …Kang Sheng immediately confirmed his value to Mao by using his ideological expertise to boost the Chairman's ideas and cult and by indiscriminately backing both his 'rightist' policies in 1957 and his leftist policies during the GLF. …But when Mao sounded the leftist tocsin at Beidaihe, Kang Sheng responded with alacrity, making an 180-degree turn. His stratagem was to attack the manuscript of a novel about a revolutionary martyr, Liu Zhidan. Liu Zhidan was born in 1903 in the northwestem province of Shaanxi. In 1926, already a CCP member, he entered the fourth class (along with Lin Biao) at the Whampoa Military Academy, directed by Chiang Kai-shek with Soviet military advisers. After the CCP-KMT split in 1927, he had returned to his native province and set up a guerrilla group. For a time he was under attack by 'leftists' in the CCP leadership, but after Mao and the Long Marchers reached Shaanxi in 1935, he was rehabilitated. He died in battle against the KMT in 1936, still in his early thirties. The origins of the novel about his life resembled that of the play about Hai Rui. Wu Han had no intention of writing a play about the Ming official, but did so after being importuned by a theatrical company. His reluctance stemmed from his not being a playwright. Li Jiantong, the author of Liu Zhidan, also had grave doubts about accepting the commission when approached in the mid-1950s. She thought she did not have the appropriate artistic or ideological talents. The matter was complicated because she was married to Liu Zhidan's younger brother, Liu Jingfan, a vice-minister of geology, and had had a complicated 'struggle relationship' with Liu Zhidan. Li’s husband was against her accepting the commission. But the Workers' Publishing House had decided that Liu would make a good subject for a planned series of uplifting and edifying revolutionary sagas. By sponsoring fictionalized accounts, the publishers could hope to invoke artistic license as an excuse for either mistakes or gaps, and perhaps this was what persuaded Li Jiantong. Liu Zhidan’s most senior surviving comrade-in-arms, Vice-Premier Xi Zhongxun, warned her, when he learned of the project, that it would bring her grief because of all the intra-party disputes in which Liu had been involved, but she eventually decided to ignore his advice and, like Wu Han, took on an assignment for which she had little experience. After two years of collecting materials and interviewing many of Liu's one-time comrades-in-arms, she began to write in 1958 and submitted her third draft to the publishing house in 1959. The editors found it acceptable, but Li asked them to submit it to Xi Zhongxun for his approval. Like Liu Zhidan, Xi hailed from Shaanxi. Born in 1913, he had joined the YCL in 1926 and the CCP in 1928. By 1932, still in his teens, he had set up a guerrilla force in the Shaanxi-Gansu border region. It was there that he became associated with Liu and Gao Gang, who were the two leading communists in the northwest prior to the arrival of Mao and the Long Marchers. During the civil war, as the PLA moved south, Xi remained in the northwest as the leading party official in the region, a role he maintained into the early 1950s, until he moved to the capital. After a brief spell as director of the CC's Propaganda Department, Xi took on a pivotal bureaucratic role as secretary-general of the State Council in 1954, a post which he still occupied in 1962. Xi was unhappy with the manuscript, and it went through three more drafts, at which point he appears to been worn down by the persistent author, and he gave the project his blessing without reading any of the later drafts thoroughly. But Li Jiantong took the additional precaution of submitting the fifth draft to her old teacher Zhou Yang in the spring of 1962, and harried him into reading it. Zhou, whose position as the CC Propaganda Department's deputy director in charge of literature gave him the authority to issue an imprimatur, raised some issues, but did not forbid publication. At least one senior cadre, originally from Shaanxi, did take exception to the book. In a letter to the author in the summer of 1962, Yan Hongyan, an alternate CC member, a three-star general, the 1st secretary of Yunnan province, and a one-time companion-in-arms of Liu Zhidan, expressed the view that no writer could assume the responsibility for making historical judgements; that was up to the Cc. In view of Yan's objections, it was decided to publish a few chapters from the sixth draft in The Gongren Ribao (Workers' daily) and Zhongguo Qing-nian (China youth) in order to gauge public reactions. At Beidaihe, Yan immediately lobbied the AIl-China Federation of Trade Unions (ACFTU) and YCL leadership - Liu Ningyi and Hu Yaobang then headed those organizations-to have publication stopped. Yan also raised the matter in writing with the head of the CC's General Office, Yang Shangkun, and again on 8 September at a preparatory meeting for the 10th plenum. Unfortunately for Li Jiantong, Xi Zhongxun, and a number of senior CCP officials, Yan Hongyan took the further step of mentioning the matter to Kang Sheng, c1aiming that the aim of the novel was to reverse the verdict on Gao Gang. Unlike Liu Zhidan, Gao Gang survived the warfare in the northwest, rising high in Mao's favour. But he overreached himself in 1953, when he attempted to supplant Liu Shaoqi as Mao's eventual successor and allegedly plotted with the head of the CC's Organization Department, Rao Shushi, to bring about a major reshuffle of the CCP's top leadership. Both men were purged; Gao was put under house arrest and later shot himself. The Gao Gang affair was still alive issue in 1962. As we have seen, by the time of the Seven Thousand Cadres Conference, it was Peng Dehuai's alleged involvement in it that had to be used as the major justification for Mao's refusal to rehabilitate the marshal, since his trenchant criticisms of the GLF had been proved correct. Thus it was no wonder that Kang Sheng should prick up his ears at the mention of a new Gao Gang angle. ln the tense atmosphere of intra-party struggle revived at Beidaihe by Mao, here was a heaven-sent opportunity for Kang to prove again to the Chairman his indispensability in ferreting out traitors. Among Kang's current positions was vice-head of the CC's Culture and Education Small Group and head of its theory section, and on that authority he ordered the Propaganda Department to stop any further publication of chapters from Liu Zhidan, even though at this point he had not even seen the manuscript. He ordered 300 copies of the third draft and 600 copies of the fifth draft to be printed and distributed for examination by the Beidaihe conferees. On 24 August, he wrote to the CC's General Office to say that this was not simply a literary issue but had political implications. He coined the phrase 'using novels to promote anti-party activities is a great invention, which Mao embraced with enthusiasm, and which indeed was subsequently attributed to the Chairman. But author Li Jiantong was small fry, and so Kang Sheng concocted the idea of a high-level plot masterminded by Xi Zhongxun. Why did Mao seize on the Liu Zhidan affair and give Kang Sheng his head without really looking into the matter, or indeed believing the charges?200 Did he not have enough to do discouraging his leagues from pursuing revisionist policies in the countryside and abroad? One reason was probably that he welcomed a fresh case seemingly tailor-made to justify his warnings on the need for class struggle and eternal vigilance. Secondly, ever since the Hungarian revolt and the Hundred Flowers in China, he had been extremely wary of the ability of intellectuals to use their professional skill for nefarious political purposes, what might be called the Petofi Circle syndrome. Kang's new concept resonated with him, and as the 1960s progressed, Mao would increase the pressure on the intellectuals. Finally, as Kang Sheng doubtless intuited, attacking Liu Zhidan was an excellent way to demonstrate the continuing relevance of the Gao Gang affair, and thus provide additional justification for the refusal to rehabilitate Peng Dehuai. For his own reasons, Liu Shaoqi had to fall in with this strategy vis-à-vis Peng Dehuai, but at the 10th plenum he also condemned Xi Zhongxun and Liu Zhidan in the same terms. There is no record of Zhou Enlai attempting to save a man he evidently regarded as a key member of his State Council team; with Mao's permission and Chen Yi in attendance, the premier tried only to comfort Xi Zhongxun with an assurance that if the Liu Zhidan accusation was a mistake, it would be corrected. At the 10th-plenum, Kang Sheng was thus free to lead the attack on Xi, and thereafter to lead the second special case review commission in its investigation of the supposed 'anti-party group' led by Xi; Jia Tuofu, a one-time associate of Liu Zhidan and currently a CC member and a vice-chairman of the State Planning Commission; and the author's husband, Liu Zhidan's brother, Liu Jingfan. Kang Sheng alleged that a character in the novel named Luo Yan represented Gao Gang, just as three years later he would claim that Hai Rui was Peng Dehuai. Officials at the publishing house and throughout the northwest were investigated, and the case had still not been concluded when the Cultural Revolution broke out and it became public knowledge. Kang Sheng's reward was promotion to the CC's secretariat at the 10th plenum. Two months later, he moved to the Diaoyutai guest complex in the capital to mastermind a team of ideologues for the campaign against Soviet revisionism. The most cynical hit-man of Mao's Cultural Revolution swat team was now an agent in place, helping to initiate the domestic and foreign policies that were the prelude to that cataclysm. The speech, delivered in front of students at Mr Wen's alma mater, the Nankai high school in Tianjin, recalled the paranoia and fear of life in China at the end of the 1950s as a deeply divided Communist party hunted down its opponents. "I was born into an intellectual family in Yixing, north Tianjin in 1942. My grandfather ran a school in the village. It was the first primary school to admit girls, against pressure from the local landlords. Many of the teachers were university graduates and some became professors after 1949," said Mr Wen, delving into his past for the first time publicly. According to a transcript published in China's official state media, Mr Wen said he had carried his grandfather's body to hospital. "He died of a cerebral haemorrhage in 1960. The school he taught at had kept his files, filled with one self-criticism after another, written in small neat characters," he said. At the time, the Communist party had forced intellectuals, many of whom had been educated abroad or had worked for the previous government, to "revise their thinking" through self-criticism until they became ideologically sound. After inviting them to speak out about China's problems, Chairman Mao performed a u-turn and attacked those who were bold enough to voice their opinions publicly. After I went to high school and university, my family suffered constant attacks in the successive political campaigns," added Mr Wen. "In 1960, my father was also investigated for so-called 'historical problems'. He could no longer teach and was sent to work on a farm on the outskirts of the city tending pigs. My father was an honest man, hardworking and diligent throughout his life." China's top leaders rarely, if ever, discuss their personal history or family lives. And the attacks by Chairman Mao on 550,000 intellectuals at the end of the 1950s remain a deeply sensitive, and strictly-censored, topic. However, analysts said Mr Wen was sounding a warning to hardliners within the Communist party about the perils of maintaining an iron grip and refusing to reform the country. 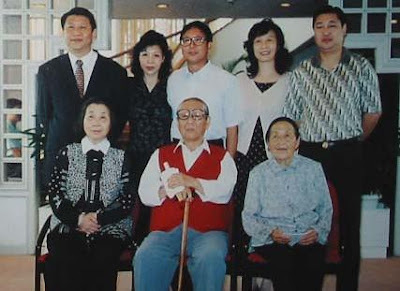 The attacks on Mr Wen's family came at a time when the Communist party under Mao was split internally over how to set a path for the country, with liberal and hardline factions taking opposing views. In the end, liberal forces lost out, much to China's subsequent woe. "My childhood was spent in war and hardship. The poverty, turmoil and famine left an indelible imprint on my young soul [ ...] I realised only science, truth-seeking, democracy and hard work can save China," said Mr Wen. As the 69-year-old gets ready to step down next year and hand power over to a new generation of Chinese leaders he has made a flurry of speeches calling for "urgent" political reform and the loosening of the party's iron grip on the state. However, there is little sign that reform is forthcoming. Some have suggested that Mr Wen is merely trying to paint himself on the right side of history, while others have noted that he lacks a broad enough power base within the party to effect any change. Liu Shanying, a researcher at the Chinese Academy of Social Sciences, said Mr Wen's speech might be read as an attempt to warn China's future leaders not to repeat the mistakes of history. "As far as I recall, this is the first time that Wen Jiabao has discussed the political persecution of his family. He had not mentioned it even in his memoirs. Of course politicians are different from normal people and every word they say has a meaning," he said. "When he talks about his childhood suffering, I think he means that he does not want to see China return to that era. He, and many other Chinese are victims of that era, and he is expressing the desire for peace and stability to calm down some of the other elements in the party," he said. "It also shows his discontent with the recent sixth plenum, about how to restructure China's culture and the continuing need for control over public opinion," he added. Mr Wen's speech was also read by some as a pledge that he would continue to push his reform agenda even in retirement. Five years ago, I wrote this article '1971 War: How the US tried to corner India'. It appeared in Rediff.com on December 26, 2006. (Dr S N Prasad in his introduction to the Indian government's Official History of the 1971 War). I am not usually a great defender of United States policies, but I have to admit that in the field of right to information, the US is far ahead of the Indian babus who obstinately block access to Indian archives under the lame pretext that this could 'endanger national security'. A few months ago, the Office of the Historian at the US State Department released Volume XI of the Foreign Relations of the United States devoted to the 'South Asia Crisis, 1971': in other words, the Bangladesh War. This 929-page publication groups together documents which were already known like the minutes of Henry Kissinger's secret visit to China in July 1971 as well as scores of freshly declassified material available for the first time to the public. It throws light on a less known angle of the India-Pakistan conflict: The role of the nascent friendship between the United States and China. This is a welcome new piece in the puzzle of the history of the 1971 War. The US administration saw the unfurling events differently. But events in the subcontinent and the Chinese factor forced Nixon to change his stand. The new closeness between Washington, DC and Beijing and the involvement of the Pakistan president as a secret go-between greatly influenced US policy. It is here that the Chinese saga began. In a tightly guarded secret, Nixon had started contacts with Beijing. The postman was Pakistani dictator Field Marshal Yahya Khan. When on April 28 1971, Kissinger sent a note defining the future policy option towards Pakistan, Nixon replied in a handwritten note: 'Don't squeeze Yahya at this time.' The Pakistan president was not to be squeezed because he was in the process of arranging Kissinger's first secret meeting to China. The events of the following months and the US position should be seen in this perspective. During the second week of July, Kissinger went to Beijing where he was told by then Chinese prime minister Zhou Enlai: 'In our opinion, if India continues on its present course in disregard of world opinion, it will continue to go on recklessly. We, however, support the stand of Pakistan. This is known to the world. If they (the Indians) are bent on provoking such a situation, then we cannot sit idly by.' Kissinger answered that Zhou should know that the US sympathies also lay with Pakistan. The State Department historian says, 'in the perspective of Washington, the crisis ratcheted up a dangerous notch on August 9 when India and the Soviet Union signed a treaty of peace, friendship and cooperation.' It was a shock for Washington as they saw a deliberate collusion between Delhi and Moscow. During the following months, the situation deteriorated and many more refugees came to India. The Indian prime minister decided to tour Western capitals to explain the Indian stand. On November 4 and 5, she met Nixon in Washington, who told her that a new war in the subcontinent was out of the question. 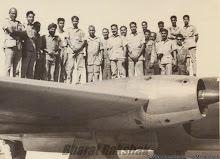 To divert the pressure applied by the Mukti Bahini on the eastern front, the Pakistan air force launched an attack on six Indian airfields in Kashmir and Punjab on December 3. It was the beginning of the war. The next day, then US ambassador to the United Nations George H W Bush -- later 41st president of the United States and father of the current American president -- introduced a resolution in the UN Security Council calling for a cease-fire and the withdrawal of armed forces by India and Pakistan. It was vetoed by the Soviet Union. The following days witnessed a great pressure on the Soviets from the Nixon-Kissinger duo to get India to withdraw, but to no avail. For Kissinger it was clear that Indira Gandhi wanted the dismemberment of Pakistan. 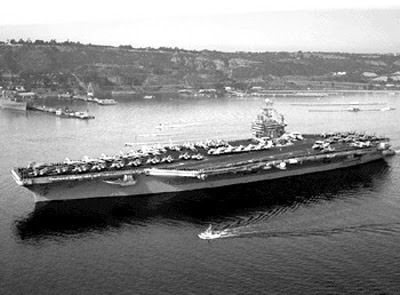 On December 9, when the CIA director warned Nixon that 'East Pakistan was crumbling', Nixon decided to send the aircraft carrier USS Enterprise into the Bay of Bengal to threaten India. Let me recount an anecdote related to me by Major General K K Tewari (retd), Chief Signal Officer, Eastern Command, during the 1971 War. General Tewari was present at a briefing the three defence services held for Indira Gandhi. She was seated at a large table. On one side was General S H F J Manekshaw, the army chief, and on the other Admiral S M Nanda, the navy chief. All the officers present were stunned. Ultimately, their morale was tremendously boosted by the prime minister's attitude. She had demonstrated her utter contempt for the American bluff. This was conveyed to Huang Hua, China's envoy to the United Nations. Kissinger told Huang the US would be prepared for a military confrontation with the Soviet Union if the Soviet Union attacked China. On December 12, the White House received an urgent message. The Chinese wanted to meet in New York. General Alexander Haig, then Kissinger's deputy, rushed to the venue, but was disappointed. Huang just wanted to convey his government's stand in the UN, no words of an attack in Sikkim or in the then North East Frontier Agency (now, the northeastern states). Until the last day of the war, Pakistan expected its Chinese saviour to strike, but Beijing never did. In Washington, Nixon analysed the situation thus: 'If the Russians get away with facing down the Chinese and the Indians get away with licking the Pakistanis...we may be looking down the gun barrel.' Nixon was not sure about China. Did they really intend to start a military action against India? Kissinger's South Asia policy upset many in the US, not only the American public, the press but also the State Department, and more particularly, Secretary of State Rogers who was kept in the dark most of the time. It is worth mentioning an episode which, of course, does not appear in the American archives -- The Tibetan participation in the conflict. After the debacle of 1962, the Government of India had recruited some Tibetans youth in the eventuality of another conflict with China. The Special Frontier Force was trained in Chakrata in Uttar Pradesh [ Images ] under the command of an Indian general. In 1971, nine years after its creation, the SFF was sent to East Pakistan to prepare for the arrival of regular Indian troops. Their saga is one of the least known parts of the Bangladesh war. Late October 1971, an AN-12 airlifted nearly 3,000 Tibetans who later assembled at Demagiri close to the India-East Pakistan border. On the other side of the border were the Chittagong Hill Tracts. Armed with Bulgarian-made assault rifles, the SFF was given the task of organising guerrilla raids across the Chittagong Hill Tracts. Opposite the SSF, in thick jungles and leech-infested marshes, was stationed a Pakistan brigade, including a battalion of its elite Special Services Group. The Indian army knew this brigade was a threat to one of its corps preparing to advance on Dhaka. During the second week of November, Operation Eagle began. Leaving Demagiri in canoes, the Tibetans commandos entered East Pakistan. The SFF then started overrunning one Pakistani post after another. On December 16, the SSF was 40 kilometers away from Chittagong port, having successfully managed to neutralise the Pakistani brigade. After Pakistan's surrender, they paraded through Chittagong. Unfortunately, 49 Tibetans lost their lives for a nation which was not theirs. The release of the State Department volume on the 1971 conflict is a posthumous homage to the courage of the Indian Army which despite heavy odds and the might of the United States freed Bangladesh from Pakistani clutches. Some aspects are still missing to make the puzzle complete. First, the Indian history from the Ministry of Defence does not detail the political compulsions of Indira Gandhi's government. Second, the secret operation involving the Tibetan Special Frontier Forces in the Chittagong Hill Tracts is virtually unknown. Lastly, the Chinese involvement from the Chinese point of view remains unexamined. Like the Henderson Brooks' report on the 1962 border war with China, it may take a few decades more to be revealed. Why the deep Chinese gloom?